The evening will include a family friendly night market offering some of the region’s best food, wine and hand-made crafts, along with live musical performances to entertain you. This event is weather dependent. In the unlikely event of extreme weather, ticket holders will receive an email on the day of the event advising of event cancellation and all tickets would be refunded in full. Event updates will also be posted on the Event Facebook page. Is this event weather dependent? Yes, however this event will only be cancelled in the instance of extreme weather. In the event of unsuitable weather you will receive an email on the day of the event advising of event cancellation. Event updates will also be posted on the Event Facebook page. In the unlikely event of a complete weather cancellation, all tickets will be refunded in full. A free shuttle will be operating on the night. Pick up locations will be Mudgee Visitor Information Centre, Mudgee High School, St Matthews Catholic School, and Mudgee Racecourse. Shuttle pick-ups will operate between 4:00pm and 5:30pm. Further details will be posted on the event page in the weeks before the event. NO PARKING, other than mobility parking, will be available on site. Park at either the Mudgee Visitor Information Centre, Mudgee High School, St Matthews Catholic School or Mudgee Racecourse and catch the free shuttle to the event. Mobility parking spaces are available onsite at Glen Willow Stadium. Homemade food items are allowed to be bought into the event. A range of food and beverages outlets will be available on the evening. Bring your own picnic blankets or seating to make the most of your Mudgee Night Glow experience. No Umbrellas or Tables Allowed. Non-metal cutlery only - we suggest reusable plastic or bamboo cutlery. Small Soft Eskys/Cooler Bag Style are allowed to be bought into the event. BYO alcohol will not be permitted. Bags/Esky Bags will be searched at the Event entry points. All drinks that are bought into the event i.e. soft drinks and water must be unopened/sealed. Tickets are refundable up until 30 days before the event. No refunds will be offered after this time (other than in the event of weather cancellation) but are transferable. In the event of extreme weather, that would prevent the entire event from proceeding, tickets will be refunded. You will need to have your ticket with you at the gate, either as a digital copy in your email from 123Tix, or a printed copy. You won't be able to enter the event without a ticket so don't forget to bring it with you. Yes, tickets are transferable so the name on the ticket does not need to match the name of the person attending. Yes, Companion tickets will be available when purchasing a full priced ticket. 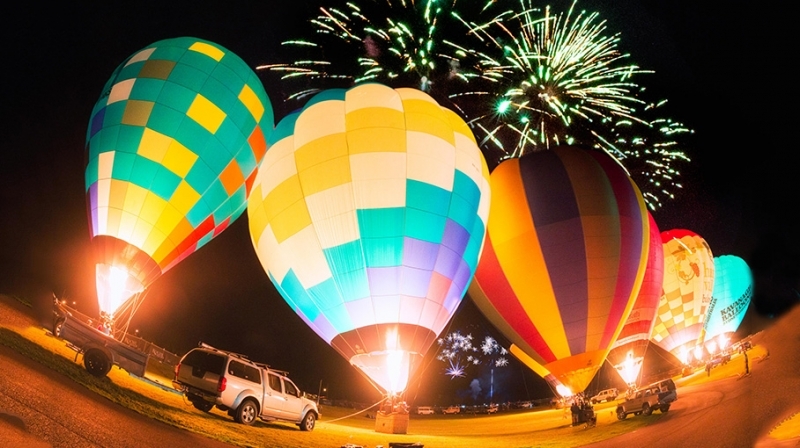 Please contact the event organiser at events@balloonaloft.com with your government issued Companion Card details and you will be provided with a unique code and instructions to purchase a Companion Ticket. How can I arrange Wheelchair Accessbile Tickets? I have a food stall and would like to participate in the event. Who do I contact? No, there won't be any tickets available at the gate. You will need to purchase your tickets online in advance. Tickets are only refundable up until 30 days before the event. Please be aware that this event is weather dependent so in the event of extreme weather conditions, ticket holders will receive an email on the day of the event advising of event cancellation. Event updates will also be posted on the Event Facebook page. In the unlikely event of a complete weather cancellation, all tickets will be refunded in full. Breach of the above conditions may result in the removal of the patron from the site. Homemade food items are allowed to be bought into the event, plastic disposable cutlery only. A range of food and beverages outlets will be available on the evening. Bring your own picnic blankets or seating to make the most of your Mudgee Night Glow experience. No Umbrellas Allowed, No Tables Allowed. Small Soft Eskys/Cooler Bag Style are allowed to be bought into the event. BYO alcohol will not be permitted. Bags/Esky Bags will be searched at the Event entry points. All drinks that are bought into the event ie soft drinks and water must be unopened/sealed. Any person found involved in underage drinking or caught with BYO alcohol will be issued a citation and a fine by the Police, and evicted from the Event site. Guardians of any minors involved will also be removed and be evicted from the Event site. A free shuttle will be operating on the night. Pick up locations will be Mudgee Visitor Information Centre, Mudgee High School, St Matthews Catholic School, and Mudgee Racecourse. Shuttle pick-ups will operate between 4:00pm and 5:30pm. Further details will be posted on the event page - in the weeks before the event. No parking, other than mobility parking will be available on site. Park at either the Mudgee Visitor Information Centre, Mudgee High School, St Matthews Catholic School or Mudgee Racecourse and catch the free shuttle to the event. Mobility parking spaces are available onsite at Glen Willow Stadium. Vehicles with a valid RMS issued Mobility Parking Permit will be able to park onsite. Parking attendants will be onsite to direct you to the correct parking area. No other parking will be available on site. While every attempt is made to present the program as advertised, the program may be subject to change without notice. No refunds will be given due to a change in programming or weather restrictions. All minors must be accompanied to the festival by an adult Guardian. A responsible Guardian of 25yrs or older must accompany all youth patrons (13-17 years old). A 25+ Guardian may accompany a maximum of 3 youth patrons only. Due to liquor licensing conditions within the Event precinct, all minors must be accompanied by a Guardian when they enter the Event precinct. It is the responsibility of the Guardian to ensure that all minors they accompany comply with instructions issued by Event staff and/or contained in all permanent and temporary signage throughout the Event site. If a minor is evicted, their Guardian and all other accompanying minors will also be evicted. NO EXCEPTIONS. Any breach of these conditions may result in the eviction of the Guardian and all accompanying minors from the Event site. Patrons may be photographed and/or filmed at the Event and these images may be used for a variety of printed, online and broadcast promotional and/or internal purposes in relation to the Event. Footwear is compulsory at all times. No pets are allowed on the Event site.